Special Containment Procedures: SCP-4035 is to be kept within a standard containment chamber guarded by at least one member of site security at all times. Testing involving SCP-4035 must be approved and supervised by a minimum of 1 Level 3 personnel. Any personnel who attempt to gain unauthorized access to SCP-4035 will be subject to disciplinary action. SCP-4035’s containment chamber is to be regularly stocked with working lightbulbs for testing purposes. 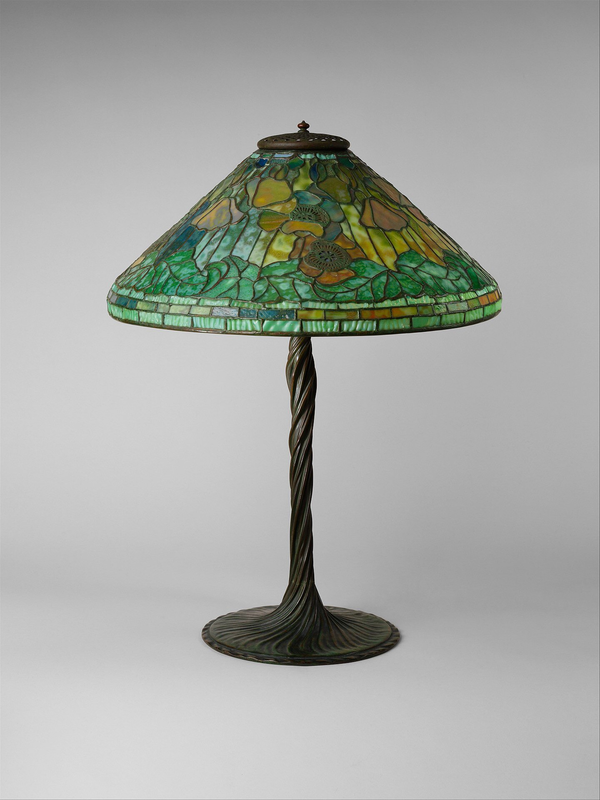 Description: SCP-4035 is a table lamp with a stained glass patterned lampshade and an iron base. SCP-4035 does not appear to have any form of wiring or electrical components within it, other than a standard lightbulb socket. When a lightbulb is inserted into SCP-4035, an entity made of an unknown gaseous substance will apparate from within SCP-4035. This entity, referred to as SCP-4035-1, has the appearance of a balding Caucasian male between the ages of 40 and 50, wearing a patchy suit coat. The legs and abdomen of SCP-4035-1 appear as a cloudy blue gas that leads to within SCP-4035. SCP-4035-1 does not appear to be able to move freely, and has not attempted to do so. When SCP-4035-1 manifests, it will direct its attention towards the person who placed the lightbulb inside of SCP-4035. SCP-4035-1 has not reacted to outside stimuli when it manifests, and will not respond to questioning from any parties. Once SCP-4035-1 has fully manifested, it will introduce itself, and ask “What are ya in the market for?” SCP-4035-1 has introduced itself by a variety of names, such as Bobby Spiff, Danny Fry, and Josephi Krakowski. Once the subject that placed the lightbulb inside of SCP-4035 responds in any way, SCP-4035-1 will give the subject a biological modification or unnatural ability through unknown means. This ability will always directly relate to the subject’s response, but will be described by the subjects as “lackluster” and “disappointing.” These abilities have been shown to be often detrimental to the subject and possibly severely harmful to their well being. Addendum 1: The following are several testing logs to determine the extent of SCP-4035-1’s abilities. Resulting Ability: Subject was able to identify the chemical composition of all types of feces, as well as the creature it originated from. Statement: Subject was instructed to request “Muscle regeneration” from SCP-4035-1. Subject requested this without issue. Resulting Ability: Once SCP-4035-1 what manifested, D-0672 was shot twice in the chest by onsite security. Upon the second impact, subject’s muscular system began to swell and multiply to approximately 245% of its original size. Subject began showing signs of extreme distress until his vital signs ceased 3 seconds later. Autopsies revealed no abnormalities and the corpse was incinerated. Statement: Subject was instructed to request “Flight” from SCP-4035-1. Subject requested this without issue. Resulting Ability: Subject appears to be unaffected by Earth’s gravitational pull. Subject does not appear to to able to control their flight, only being able to propel herself by pushing off of objects. Resulting Ability: Footage shows that after the demanifestation of SCP-4035-1, Jacobson suddenly impacted the wall of the containment chamber with a large amount of force. Jacobson was discovered 2 hours later, still adhered to the wall. During this time, his epidermis was shown to have properties similar to that of a magnet. Due to this, personnel were unable to remove Jacobson from the wall, who later died of a spinal injury suffered during the impact. Upon his death, Jacobson’s corpse ceased all anomalous properties. The corpse was autopsied and incinerated as per protocol. Addendum 2: After extensive testing with SCP-4035, it has been theorized that while in proximity to the object, sapient beings are more likely to experience sudden speech problems such as parapraxis1 or signs of ankyloglossia.2 Studies have revealed that subjects communicating within 20 meters of SCP-4035 are 68% more likely to experience parapraxis, which often results in unintended modifications when speaking with SCP-4035-1. Further research into this effect is currently ongoing. All further testing is to be recorded in Experiment Log-4035. 1. Commonly referred to as a Freudian slip. 2. Commonly referred to as being “tongue tied”. Whether the speaker actually suffers from ankyloglossia or not does not appear to affect this probability.